Round brilliant cut diamond set prominently in six claws, accompanied by a finely tapered band with open shoulders. 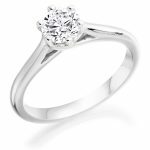 Trust and confidence the two most important things when you are looking to buy a diamond or a peice of jewellery. 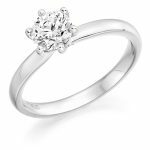 At Madison all our certificated diamonds come with the reassurance of a GIA certificate whether it be a round brilliant-cut, princess, emerald, marquise, oval, pear, asscher, radiant, cushion or heart-shaped. 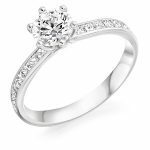 All our jewellery can be made in platinum, 18ct yellow and white gold, in our own workshop to meet your individual needs.